Puerto Vallarta might want to see what they are doing wrong because just a few months ago the sunny Mexican resort was attacked by a vicious, man-eating Dinoshark unleashed upon them by the completely callous and uncaring ‘filmmakers’ at Roger Corman enterprises who follows up that seminal masterpiece with this work of art ‘Sharktopus’, yet another beast that is now terrorizing the bikini clad babes of Puerto Vallarta. Please recognize that Dinoshark was superior to Sharktopus in every conceivable measurable category and also recognize that Dinoshark was terrible. Absolutely terrible. But we here at the FCU enjoyed Dinoshark. We did not enjoy Sharktopus. A movie so un-entertaining that it completely nullified the trump card that is the Eric Roberts factor. That is not easy to do. Apparently brilliant scientist Dr. Sands (E-Rob) has been commissioned by the navy to create a device that can hunt down terrorist and drug runners. Thus with the help of his hot daughter, the brilliant geneticist Dr. Nicole Sands (Sarah Malakul Lane) these nuts have spliced together a shark and an octopus. 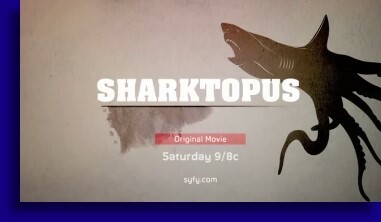 It’s never explained to us why they did this so I guess we will have to wait for the Director’s Cut for this info, but there it goes… a sharktopus. The problems begin when the device controlling the sharktopus gets knocked off. One would think that these brilliant scientist would embed a controlling device inside this thing as opposed to a clunky, loosely attached Logan’s Run collar but regardless, the sharktopus is out and about and killing everything and everybody. Now we need the sharktopus caught and to that end Dr. Sands is forced to call upon greedy mercenary Andy Flynn (Karem Bursin) who is more than willing to catch the beast codenamed S-11, but for a hefty fee. Note that the character of Andy Flynn does nothing in this movie that anybody could’ve done for free such as allowing almost everybody around him to die, badly shoot an automatic weapon and get himself all f’d up. For this he was charging 300 large. Dr. Sands, despite the fact that the sharktopus and its barded tentacles is in the process of murdering all of Puerto Vallarta, wants his creation saved and not killed. He might even love his S-11 prototype more than he loves his baby girl. But S-11 don’t love him. Believe that. Will Andy, the worthless oceanographer turned mercenary and Dr. Nicole, the worthless geneticist find a way to save the day? Sure they will. At least until Barracudapus or turtleshark or Jellypiranha attacks Puerto Vallarta. The main problem with ‘Sharktopus’ outside of the simple facts that it was boring, poorly acted, and boring is that it tried to be funny. It has been my limited experience that if one is making a crap movie and then attempts to make this crap movie intentionally funny, you have just created a crap movie that is not funny. Dinoshark for instance took itself deadly serious, particularly star Eric Balfour who seemed convinced he was channeling the ghost of Robert Shaw (Jaws), and as such there was genuine humor in the seriousness of ‘Dinoshark’. My point is, I guess… as if I would know… humor unearthed in the seriousness of it all is genuine. Attempting humor and then having it not be funny, well that’s just plain failure. And that’s what we have with ‘Sharktopus’. 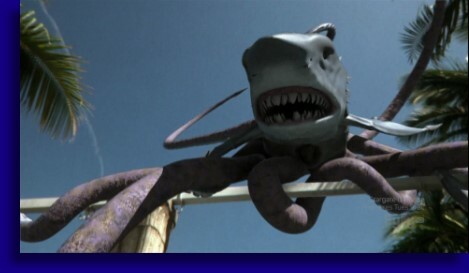 Since the movie is called Sharktopus you know it’s going to be stupid already so there’s really no reason to make it more stupid. Our hero corners our heroine and accuses the genetics team of maybe ‘splicing genes together’. I’m no molecular geneticist, well actually I am, but for arguments sake let’s assume that I am not, but it seems pretty clear to me that a sharktopus is solid evidence that some genes have been spliced together. But then I am a trained professional. That was one of the rare instances of genuine stupidity in this flick with the rest of the stupidity being designed. Bad decision. Plus I’ve seen a couple of director Declan O’Brien’s previous movies in ‘Cyclops’ and ‘Wrong Turn 3’ so I know the man can do quality genuinely unintended stupid movies with the best of them, but I guess my man just can’t do real comedy. If there’s anything good to say about this movie I guess we could mention that this movie has about as many bikini clad babes in it as any movie ever and I guess Roger and his producing partner wife Julie must have stock at the Puerto Vallarta tourist bureau since half of this movie consist of loving shots of Puerto Vallarta tourist attractions. And actress is actress Sara Malakul Lane is mighty cute, looking like an updated 2010 version of Phoebe Cates which can never be a bad comparison, but that would be about it. For a movie called ‘Sharktopus’ to fall below expectations it would have to be pretty damned bad and amazingly ‘Sharktopus’ was even worse than that. Personally I’d just wait for ‘Dinoshark’ to air again for your Puerto Vallarta tourist attraction bad CGI monster fix.